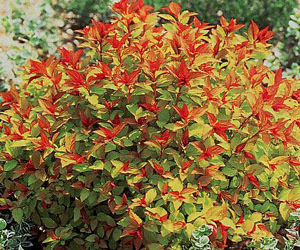 The Spirea 'Magic Carpet', Spirea japonica 'Magic Carpet', is a colorful shrub that fits almost anywhere in the landscape. In spring the leaf shoots emerge vibrant red, maturing into rich bronze to light green red-tipped foliage. Clusters of deep pink flowers cover the plant in early summer. In fall the foliage takes on russet tones that remain colorful well into November. The 18 to 24 inch rounded plants are full and bushy. Full sun brings out the brightest colors. This plant is very drought tolerantand beautiful in the fall.